True Grits: Hominy or Corn? 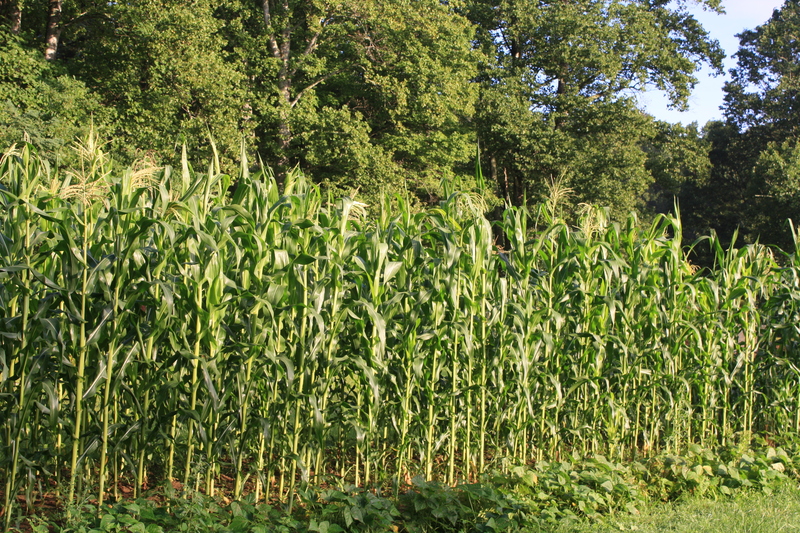 Hickory King corn, a good variety for grits. A very tall corn. When I was growing up here in Transylvania County we never ate grits. I was an adult before I ever tasted them. And I have to say I cared not for them then. I found them blah, bland and tasteless. But I learned to add salt; and with butter they got better. Now I have them two or three times a week or more. They grow on you. And no, they don’t grow on bushes. I knew a man once who enjoyed spinning a yarn occasionally. He particularly delighted in telling Yankees how he harvested grits in the fall, shaking them off the grit bushes into a sheet! There are two types of grits – hominy, and corn. However hominy is corn. So actually, all grits are corn. The difference is in the processing, or lack of it. To make hominy, corn must be soaked in lye or a similar agent until it swells and pops off its husk. The result is a softer grain that when cleaned and dried grinds easily into grits. Almost all grits sold in supermarkets and eaten by consumers today are hominy grits. Hominy can be eaten as it is after processing. I remember hominy being served at meals from time to time when I was a child. A grain of corn having become hominy is quite a bit larger than its original size, and the taste is different from that of ordinary corn. My aunt Edna told a funny story about the time Grandma left her and my mother in charge. They decided to cook dried hominy. They built the fire in the stove, put on a pot of water, and poured in as much hominy as they thought they needed for supper. If you’ve ever cooked hominy grits you know how much water it takes, even for a small amount. Well, their hominy slurped up the water and was soon expanded to double its size or more and boiling out of the pot. Before their escapade was over, they were cooking hominy in the dishpan. Corn grits are not as readily available as hominy grits. They are mostly found in specialty shops and farm markets. Grits are almost, but not quite, corn meal. They are prepared by simply grinding whole corn into the proper size and consistency – a little coarser than coarse corn meal. Corn grits take longer to cook; they are “grittier” than hominy grits and more flavorful. If your ground corn is too coarse for grits, then it’s chicken feed — too fine, it’s corn meal. And you need to know also: corn meal is not just for corn bread. Old folks used to cook it with milk or water for “mush” that they ate with milk and sugar. That’s not my idea of tasty, but Jack says it was very good. I never ate mush, but I will swear by corn meal gravy. There’s just nothing better in the gravy line. Just use your regular recipe and substitute corn meal for flour. The flavor and texture is far better. And then there is Italian polenta, which is also ground corn, but about which I know practically nothing. I learned to like hominy grits and I must confess to having learned also to enjoy non-hominy corn grits now that I have learned the proper way to cook them. I was using too much water and consequently they were thin and tasteless. And bitter also. But the bitter taste I found is not typical of corn grits, but was due to the poor quality of that one particular batch of corn. Like a lot of folks who are senior citizens now, we didn’t have a lot of anything when I was growing up, and that included food. When we had meat, which was not too often, it was squirrel, rabbit, or little fried fish my daddy caught. But we were well fed. Mama always managed to get milk for us. And we had those wonderful staples – pinto beans – and corn bread. We didn’t know the importance of that humble combination at the time, and I was amazed years later when my cousin pointed it out to me. The beans and the corn bread constituted a complete protein!